Carl lettered in football, basketball and track while attending Tucson High School (1932-35), but his high school baseball career fell victim to a broken arm. He played football and basketball at the University of Arizona (1935-40), and was captain of the track and field team in 1940. After graduating from the UA, Carl spent several years coaching football, basketball, baseball, and track in Clifton, Arizona and in southern California, as well as coaching the U.S. Air Corps post team in Stone, England (1946). 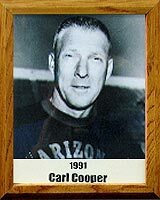 In 1951, Cooper became head track coach and assistant football coach at the University of Arizona where, during his 17-year tenure, he coached 12 All Americans, three national champions, (team record: 138-71-0). For ten years (1968-78), Carl was Executive Director of the U.S. Track and Field Federation, he promoted indoor and outdoor meets at Madison Square Garden in New York City and the Houston Astrodome, including marathons, decathlons and cross-country events. He served as a member of the U.S. Track and Field Hall of Fame in Charleston, West Virginia, in 1976. Carl was inducted into the UA Athletic hall of Fame in 1979.